When I say Italy you may immediately think about football. This makes sense. When I talk about the Verona region and Lake Garda region in Italy, the what will you think of? Still football? No, the correct answer is wines! There are a lot of outstanding wineries around these two region, and I will bring you on a journey to the wineries around those regions. Being a major amarone winery, the Fratelli Vogadori winery has years of expertise as well as a passion for tradition and eco-friendly values. They offer excellent wines and the way they produce the wine is the reason why their taste is so special. They offer a wide range of wines for you to choose from. One of them is valpolicella classic, which is a ruby-red wine that is pleasant and delicate. They use several types of grapes together with their expertise to make this very product, and it is suitable to drink this type of wine with meat dishes. For dessert wine, they can offer you with Recioto Della Valpolicella Classico. Again, the color of this wine is ruby red, but there are purple hues too for this one. It is not only warm and velvety, but also so sweet that makes it the best dessert wine. You can visit their winery and join win tasting events held by them from time to time. They regularly organize a wide range of different wine tasting experience. Since the wine to be tasted are all different, you will have a unique experience every time. It is also a way to embrace the history and culture of Valpolicella, according to them. The Fratelli Vogadori is located at Via Vigolo, 16 Negrar 37024. You can go there directly for tasting wine. Boscaini Carlo covers 14 hectares of land over looking the village of St. Giorgio Ingannapoltron. The village is famous for its ancient church and buildings. The winery is founded by Carlo Boscaini who has a great passion in producing wine. He himself died at an age of 102 due to drinking wine with high quality. Now, the winery is run by his nephews Carlo and Mario. Baoscaini Carlo stressed that they only sell wines from their own grapes production, and they do offer quite a number of wines. For example, the IGT Molinara Veronese are made the a type of grapes named Molinara, which means from the mill’. The wine is floor-wax pink in color, which is fairly special, and it is delicate on the nose if you smell it. It is an easy drinking wine for cold cuts or BBQ meats. The Zane is another product offered by them. Since it has a well-rounded and soft finish on the palate, it is the best accompaniment to red meat dishes. The wine is made from four different type of grapes using a traditional method known as Ripasso’. They can receive guests and visitors who come to their winery to taste wines. It is coupled with causal chat and informal talk about the passion to wine. If needed, tasting sessions and guided tours can also be provided to a group. Zenato company is located in the middle of Lugana and Valpolicella. There is mild climate and unrivalled charm there, which also made Zenata one of the greatest winery in Italy. The winery covers 75 hectares of land which allows them to produce different types of wine in mass volume. The founder of Zanato is Sergio Zenato who tried out new techniques of wine making and invested in native vines hoping to get the best quality of wines. This lead to the establishment of Zanata in 1960. Lugana San Benedetto DOC is one of the best selling wines offered by them. It is a white with a very strong personality, coupled with fragrant scents. It is made of Trebbiano di Lugana and purely from this type of grape only. This type of wine is good as an aperitif with cold dishes and starters. Cresasso Corvina Veronese IGT is a wine that is a tribute to the varietal features of different native grapes in Valpolicella. This is 100% made of Corvina Veronese, and comes from very careful research and experiment. You can try some of the IGT when you are also eating meats like roasts and sausages. They work well together. The Chardonnay Garda DOC contains some aromatic elements, and it is extracted from Chardonnay purely. You need to ferment it for 15-20 days in a steel of controlled temperature, and then wait for another half year for it to be ready. Customers can enjoy this type of wine with freshwater fish particularly. Zenato had also organized several wine tasting events in the pursuit of promoting their wines to the world. You can take a lot at their newsletter (available on their website) for their newest actions. Brunelli has based themselves to San Pietro in Cariano, which is the central and the main village of the Classic area in Valpolicella. With the mineral soil, grape varieties and a nice climate with breezes, Valpolicella is just the best place to set up a winery—and this is why Brunelli Wine is set up here. According to Allento Brunelli, the current owner of the winery, the art of transforming grapes into wine and then fashioning them into a perfect product has an important effect on his dreams and desires, and this inspired him to succeeded his ancestors as the owner of the winery. He also said that many wines offer a complex personality, and each type of wine is just like one of his relatives. One of the wines offered by them is the Custoza. It is a refreshing fruity white wine made from five type of grapes. This gives this type of wine a surprising complexity and a refreshing structure. It is recommended that you drink this wine risottos and fish dishes. Another type of tine available is the Valpolicella Ripasso. The wine has a great concentration in the color as well as perfume. This type of wine can mix well with rich stews, chops and mature cheeses. Brunelli is still experiencing new wines, and is dedicated to continue providing different type of excellent wines to the world. There are really a lot of great wineries around Lake Garda and Verona. This is just a blessed land naturally for producing wine with good quality. While the above four wineries produce different type of wine on their own, they shared a common feature—that is, they are all passionate at turning grapes into wine, and turning their efforts into the satisfaction of customers from the taste associated with their wine. Verona represents the main Italian tourist center due to its history. It’s the most famous town of Romeo and Juliet all around planet earth. An industrial city and bustling business center are located in Verona. This city is surrounded by famous territories known for wines production. The following are three famous wineries you shouldn’t hesitate to visit to enjoy cool wines and scenic beauty in Verona. It’s located near villages of Bardolino and Lake Garda. Zeni winery is situated on beautiful sceneries of Moreinic hills where you can enjoy a cool, inspiring panoramic view. It’s a family based wine producing Company. Currently, it’s run by the fifth generation of Zeni family. Over 130 years, Zeni family has been enthusiastically committed to the best production of premium Veronese wines. Some of the most famous wines are known in regions such as Valpolicella, Recioto, Ripasso among others. Besides the classic wines, wine museum was created for the unique exhibition. This offers an interesting itinerary to visitors through the techniques of making the old wine. It presents the old pictures, tools, and documents used to make old wines. This museum is sub-divided into different areas. Each area is dedicated to present a particular process of wine production. This includes all stages from the vine growing to wine bottling. Zeni winery has recently built a new wine cellar. This cellar is a structure that combines old tradition functionality with the modern. Impressive vaulted roof anchored on strong columns and a terra cotta floor represents this cellar. In this structure, you will find the oak barrels, barriques, and tonneaus. 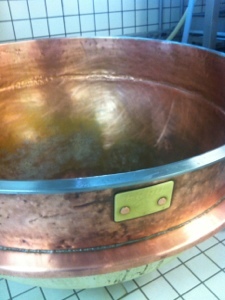 Zeni products age in the perfect condition of humidity and temperature at the cellar. Are you planning to visit Zeni winery? Relax. A guided visit is introduced for you to wine museum at Zeni. It’s followed by a relaxing stroll. This is in the hills behind the wineries along the vineyards growing Estate. The tour then proceeds to Zeni beautiful barriques cellar. It ends here where the visitor tastes a selection of wines that are chosen among the best products of Zeni wineries. Bertani is one of the most famous wineries in Verona. Historical wine production is represented at Bertani. It started producing traditional wine many years back. It produced Recioto and Amarone wines back in the 1950s. It’s a unique place combining modern and old at the same time. Bertina winery owns vast hectares of vineyards, approximately 200 hectares, in Verona. The cellar is situated at the winery headquarters located at Grezzana, North-East of Verona. This cellar is open for tours. It represents a clear example of industrial heritage. You can learn more about history that made this winery a unique expression of this land during a guided tour visit. Tools used in the past for wine production can also be seen in the cellar wine museum. Tasting of winery’s most famous wine is also possible and ends the tour. Tommasi winery is one of the largest producers of wine in Valpolicella. It was founded back in 1902. It’s a family based winery. It’s located in Pedemonte. Currently, the winery is run by the fourth generation. It owns hectares of extended vineyard. This vineyard is located in the most productive hills. Best red wines have made Tommasi one of the most famous wineries in Verona. Tommasi welcomes visitors and wine lovers for a guided tour. Tasting of famous Tommasi wine is possible for visitors. It also welcomes friends and visitors in it cellar. A tour to Tommasi Estates gives you a chance to know regions of Valpolicella Classica and its wine. It also represents a chance to understand the effort made and the passion involved in making each bottle of Amarone. Visiting the historical vineyard, which is located behind the winery building, starts each tour. Tours learn how vines are grown. The tours continue to the fruttaio. This is where grapes are dried on a loft for Recioto and Amarone. Large Slavonian oak barrels are seen down in Tommasi cellar. Aging of Amarone is done using these oak barrels. Tasting of the most famous and representative Tommasi wines ends the tour. What a beautiful and awesome moments? Make a day and visit our wineries. Enjoy to your level best. Taste the most famous wines you desire. Visit wineries impressive vineyards and other beautiful sceneries. Don’t forget to come with a friend and share this great moment and experience. All are welcome. I am a professional private-taxi driver, English speaking. Most of the time I cooperate with my partner’s agency which offers any kind of rental car service with driver dedicated to transport of passengers, available 24/7 all year long. We offers any kind of travel to agencies, to businessmen and tourists, personal travels for individuals or groups, to and from any destination as well as airport/stations transfers. Reliability, punctuality and courtesy, knowledge of English, German and French languages are our strengths. I offer trips on board of top quality cars (Minivan Ford, Mercedes Viano and Mercedes Class E), for visiting and discovering the area of Garda Lake, Palladio Villas and Vicenza, Mantova, Bergamo , Franciacorta, Soave (the area where I live) and Mezzane and Illasi Valley (is the extension of the Valpolicella area) wine tastings and tours at major historical local wineries , food tasting at Villa de Winkels in Tregnago, as well as Amarone wine tours in Valpolicella classica area. All these wineries are ready to introduce their products ( english speking) and to host the guests at any time. I offer free consulting for visits throughout the province of Verona, Garda lake and the surrounding areas, also recommending restaurants, agriturismo where they can taste many Veronese and lake specialties, and partecipate at a cooking classes. The large amount of contacts gathered over the past years allows me to recommend routes, tracks, tours, as well as accommodations in cozy and comfortable apartments, B&B, hotels in the center of Verona and nearby. The tour guides who I can introduce to, will be more than glad to accompany the guests to visit Verona and the province in order to let enjoy the wonders of art, history and culture of this beautiful city. Le Vigne di San Pietro is a wonderful boutique winery located in a botanic garden on the hillside south of Garda Lake near by Verona. The owner, an italian architect, will be with you in the vineyards to explain his vision about wine and he will drive a wine tasting in the beautiful villa above the cellar. The area is very pleasant for a tour by car or by bike. Borghetto, one of the most beautiful historical village of Italy, is near by. In summer, in Verona, they play opera in the ancient Arena Roman theatre. The visit and the wine tasting are made on reservation only. Owner: Carlo Nerozzi Architect, 55, wine maker since 1981, I’m involved in the wine and food business exporting my wines all over the world. Lake Garda and a wine tasting at local producer of Amarone can be reached easily from Verona. So if you are here for the Opera or the weather why don’t you consider taking a wine tour with tasting in the are? Are you an Opera lover? If so, make a point to put Verona on your must-visit list between June and August! Every year during the summer, Verona stages a full program of wonderful Opera presented in the most fantastic venue, the Verona Arena. To understand how wonderful it would be to attend your favourite opera in this outstanding venue, let me tell you a little about the Arena. The Verona Arena dates from Roman times, and is a huge amphitheater in the Piazza Bra in the Italian city of Verona. This amphitheater is one of the best preserved of all the ancient Roman arenas in the world, and is just the perfect setting for Opera. This huge structure has weathered many a storm since it was first built in AD30 on a site which was then outside the city walls. At that time it was so famous for the shows and games presented there that it attracted visitors from all over Italy and beyond, and it was able to seat more than 30 000 spectators. The entertainment of those times consisted of cruel gladiator sports, and when these were banned by the emperor Honorius in 404AD, the Arena stood unused and neglected for many centuries. The Arena survived a huge earthquake in 1117 which destroyed all but four of the original circle of arches that formed the top storey of the facade, built from beautiful pink and white limestone from Valpolicella, but luckily the inner core of the structure survived intact, and this is where today’s operas are staged. Verona is a splendid Romanesque city and there are plenty of other things to do there if Opera does not appeal to you; visit famous Casa di Guilietta (House of Juliet) – (Shakespeare so admired Verona that Romeo and Juliet was set in the city), or visit Piazza delle Erbe to wander around the markets or sit at a pleasant cafe and enjoy an ice-cream (gelati) while you watch the world go by and be sure to see the Duomo, the Basilica di San Zeno Maggiore and the lovely Italian gardens of Giardino Guisti. The city is also a good base from which to visit some wineries to see where some great Soaves and Valpolicellas are made. Lastly, be sure to taste a Baci di Guiletta (Juliet’s Kisses) before you leave – delicious biscuits dedicated to Juliet and found in pastry shops all over the city. Emilia Delizia would be delighted to organise a guided tour of Verona that focuses on the history,, wines and food of the town. Our company can also organise guided tours of the Arena for those interested in learning more about the building and the performances. The next time you visit Italy take the time to visit the charming and ancient town of Soave, just 23 km east of Verona in north-eastern Italy. If you thought you had to travel to Tuscany to see a walled hilltop village you are mistaken – Soave has all the necessary attributes and more! Most people will be familiar with the name Soave – the wine of the same name, produced all around the town, is world famous and probably the best known Italian wine after Chianti. Soave is a white wine produced from predominantly Garganega grapes grown on the many hillside vineyards all around the town of Soave, and has been awarded DOC status. Soave is produced in large quantities and in the past few decades the quality has been a little inconsistent. The introduction of stricter requirements for a Soave Superiore (minimum of 70% Garganega grapes, minimum alcohol content of 11.5% and at least 8 months maturation) has resulted in the production of some very fine Soave wines with much more character and flavour than was the case in the past. Some of the very best wines from the region are produced on family-owned and operated wineries and some of them are open to the public for cellar tours and tastings. Instead expect massive stainless steel tanks; not as romantic perhaps, but their wine is gaining acclaim in all the major guides and reviews. Coffele Winery: This is one of the oldest wineries in the area and is situated right in the heart of the town. Their Soave Classico is a very well-balanced wine with an exceptionally mild acidity making it a perfect accompaniment to fish and risotto dishes. They also make two other complex Classicos and are well worth a visit. After you have toured a couple of wineries, it is time to explore the town of Soave. The Castle and Medieval Walls are superbly intact and are the main attraction in the town. The castle is a traditional elevated defensive structure and dates from around 934. The medieval walls were a much later addition; they surround the town and lead up to the castle. On your visit to the castle you can see the remains of a 10th century church, visit the various castle rooms and the museum. Also worth a visit are the Palace of Justice in the centre of town and the Palazzo Cavallli and the Scaliger Palace. There are also a few churches where you can see examples of 16th and 14th century art. When it comes to food, you will not be disappointed. There are several good restaurants serving regional cuisine with plenty of emphasis on Risotto (Italy’s best Risotto rice is produced in the area) and Polenta, rather than Pasta, the more well-known Italian basic. Make sure to accompany your meal with a glass of Soave made just around the corner! This fabulous cheese is produced in the northernmost part of the Verona province since medieval times, when the Lessinia valley was occupied by the Germanic tribe of Cimbrians. 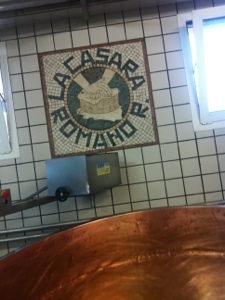 Other say that its production was introduced in this area by immigrants from Lombardy. The hilly region of Lessinia is part of the Prealps chain and is a tourist destination all year round for its great natural places – in particular the Regional Park of Lessinia – where visitors can do excursions, birdwatching and have fun at the Malga San Giorgio ski resort. A gastronomic tour is recommended to gourmet travellers to find out the typical product which gained the DOP recognition in 1996: the Monte Veronese cheese. Furthermore, the Consorzio di Tutela del Monte Veronese was founded to preserve its territory of origin, its method of production and, indeed, its authentic flavour. A great way to taste it is to visit the town of Zeno di Montagna – province of Verona – during the food festival dedicated to San Zeno chestnuts, Bardolino wine and Monte Veronese cheese. You may also enjoy tours in the dairy factories of Peschiera del Garda, Lazise, Bardolino – all close to the marvellous Lake Garda – Bussolengo and San Pietro in Cariano, to name a few. Monte Veronese DOP (or POD) is made only from cow’s milk. 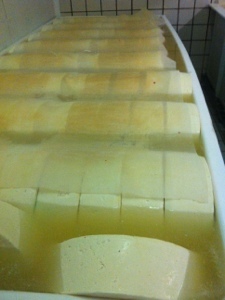 But the factor that makes this cheese so unique is that the milk is exclusively taken from cows bred in the Lessinia valleys. This element, together with the period of ageing – safeguards its organoleptic properties and original aroma of grass. You can recognize Monte Veronese varieties by the label colour and by the denomination clearly marked on them. 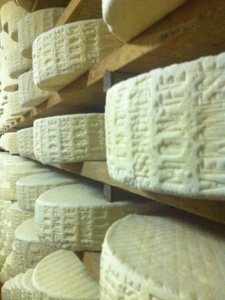 Monte Veronese made from whole milk needs an aging time of 25-40 days and can be recognized by the light green label. Your palate won’t forget its sweet long lasting flavour. Try it with marmalade to enjoy the contrast between bitter and sweet. Monte Veronese d’allevo – made from skimmed milk – is called “mezzano” if aged for more than 90 days. Its savour slightly spicy makes it perfect to serve grated on many gourmet first courses such as risotto all’Amarone or as filling in ravioli. It’s great also with the radicchio rosso di Verona IGP (PGI). Check the light blue label when you buy it. If you’re looking for strong flavours, then the Monte Veronese d’allevo vecchio – which period of aging goes between 6 months and 2 years – is the one for you. Labelled with a black tag, you will soon recognize it also by its pleasant flavour of almond. You’d rather enjoy it at the end of the meal matched with great Italian red wines such as Bardolino or Valpolicella. There is another variety, called Monte Veronese di Malga, that can be served with other food (eggs, pears, walnuts) to emphasize its flavour or with other kind of cheeses. It is the ideal ingredient of recipes based on polenta or salty pies since it gives an intense taste to the dish. It is superb if matched with the strong flavour of truffles. Emilia Delizia Monte Veronese cheese tour from Verona. Are you ready for a gourmet travel in the Verona province? 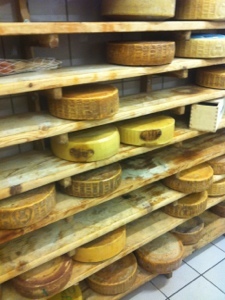 Our company organises cheese tours from Verona, Bardolino and the Valpolicella area. With our food experiences you can discover this magnificent products during your holidays in Italy. In 2007 Cav. G.B.Bertany winery celebrated 150 years of history, promoting a philosophy hinged on traditions that gave rise to many important wines like Secco Bertani, Soave and, from the middle of last Century, the one that is recognized as one of the most important wine in the world: the Amarone. The History of the Bertani winery. The winery was founded in 1857 at Quinto di Valpantena by the brothers Giovanbattista and Gaetano Bertani. Bertani’s philosophy went on drawing the image of the whole Veronese production. For example, in 1888 the local Chamber of Commerce, Handicrafts and Agriculture studied the wine production in Valpolicella Valpantena. According to the committee members the winery promptly reacted to the economic crisis due to Risorgimento riots (1866) introducing logical improvements both in the vineyards and in the wine production system. The result of such a managerial approach was Secco Bertani, a revolutionary wine for that epoch. In 1900, during Verona International Exhibition, the Agricultural, Science and Literature Academy conferred an honour upon Bertani brothers referring to the introduction of new varieties of vine, the training system methods and new wines. Bertani’s top wines: Soave, and Amarone. During the years Bertani brothers were deeply involved in reaching the maximum quality and the presence of Bertani wines in prestigious events and menus both in Italy and in Europe proved that. In fact Soave Bertani was chosen in 1937 to be the only white wine at the coronation of George VI of England. Secco Bertani then, became very quickly an icon of Italian quality wine in the world, being aboard the most luxurious cruise ship and the best restaurants and being supplied even to the Savoia’s royal catering. Because of this in the early ‘20s the winery was appointed firstly by the queen mother and then officially by the king as official supplier and allowed the use of the royal crest as one of the Italian particularly distinctive products. As it was for the first bottle of Soave, the new Amarone wine, one of the earliest Amarones produced from the Fifties became a landmark for the whole local wineries. Amarone Classico Bertani has always been keeping its character intact and its power in a perfect balance. A style that goes behind the time and grant long-lasting wines. Bertani today owns about 200 hectares (494 acres) of vineyards in the most important DOC regions that are in Verona district, namely Valpolicella Classica, Valpolicella Valpantena, Soave and Lake Garda. The winery headquarters is the cellar situated at Grezzana, built in 1860 in Valpolicella Valpantena valley, North-East side of Verona. The cellar, a beautiful example of industrial heritage, is open for tours. During a guided tour visitors can hear the history and the learning that made Bertani’s wines an unique expression of the Veronese land and they can even see tools used in the past that are exposed in the cellar wine museum. In this historical atmosphere, it is possible to taste the winery’s most famous wines. Most probably you associate Verona with the eternal lovers Romeo and Juliet, but it is actually a modern town full of history, culture and art in conjunction with business and entertainment. Nearby you can find exciting and marvellous places such as the Lake of Garda and towns as Peschiera, Sirmione or Soave. Let’s focus on the last one and its top quality wines. Soave, a town dedicated to wine. The A4 highway communicates Soave with two key cities in Northern Italy: Milan and Venice. Driving from these important metropolis is a real pleasure thanks to the good conditions of the highway and its light traffic. Its castle was already mentioned during the first millennium and it has an interesting past under the Republic of Venice or the Carraresi family from Padua. You can visit it nowadayas and admire the excellent state of the military building. Do not miss Palazzo Cavalli with frescoes by Falconetto or Santa Maria dei Domenicani church. But the real interest of the town is its excellent wine. Enjoy it during the Medieval fair held during the month of May. The quality of Soave wine is assured and certified by the labels DOC (Denominazione di Origine Controllata) and DOCG (Denominazione di Origine Controllata e Garantita). A third type of control is named IGT (Indicazione Geografica Tipica) and is preferred by some of the local producers. The main and key ingredient is Garganega grape. Most of the Soave Superiore is produced from vineyards fruits coming from the classico zone, and area created to mark off the best lands. The zenith of the production took place during the 1970s and 80s as it was highly requested in the United States. As the demand decreased, producers chose to increase the quality instead of the quantity. Almond and citrus flavors are found as a result of the Garganega grapes but it also possesses a smoky and bitter touch coming from the volcanic lands of Verona. One of the main producers of Soave wine is the renowned winery of Rocca Sveva, founded in 1898. Strategically located near the castle it is as visited as this one. Tradition and modernity are wisely combined to produce exceptional wines. Tunnels underground in which oak barrels are placed, a botanical garden, a meeting room and a tasting area are some of the facilities of the winery. Spumante or sparkling wine is also produced as well as Valpolicella variety. The main foreign client is the United States, launching an office in Boston in 2010 as its main headquarter in the country. Guided tours to discover Soave wines attract numerous tourists every year. They are usually willing to discover other local products as well, such as extra virgin olive oil, typically from the area of the Lake of Garda, or honey. But visitors in search of wine prefere to concentrate not only on Soave wines but also on Valpolicella, Bardolino, Lugana or Durello wines.